UKIP 'would abolish inheritance tax' Jump to media player Nigel Farage says that UKIP is the only party promising to remove inheritance tax completely. Osborne tackled on NHS £8bn pledge Jump to media player George Osborne has been tackled by the BBC's Andrew Marr on the Conservative Party's announcement that it would put £8bn more into the NHS should it remain in power after the election. Greens: 'We've got to rebalance society' Jump to media player Green Party leader Natalie Bennett tells the BBC's Andrew Marr that there has been an "undue focus on the deficit, and less of a thought out consideration of the kind of society we need to have". Clegg sets out Lib Dem deficit plan Jump to media player Nick Clegg spells out Liberal Democrat plans to eliminate the UK's deficit by 2017/18. Labour 'not talking to Lib Dems' Jump to media player Harriet Harman has said that the Labour Party is not talking to the Liberal Democrats in the run up to the general election, but refused to rule out some kind of an agreement should there be a hung parliament. 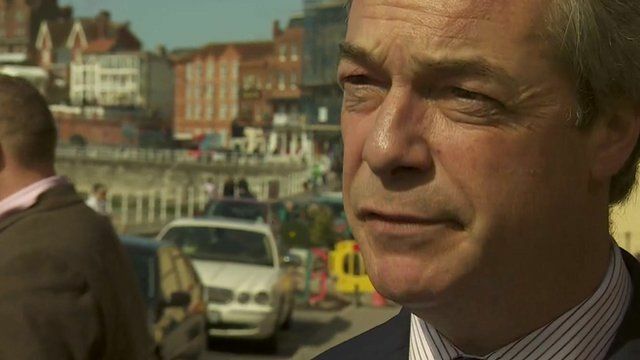 UKIP leader Nigel Farage has reacted to the announcement by the Conservative Party that it would remove family homes worth up to £1m from inheritance tax. He said that UKIP was the only party promising to remove inheritance tax completely.